Colleen Lynn was on HuffPost live on April 5th 2013, She is now throwing a Tantrum. 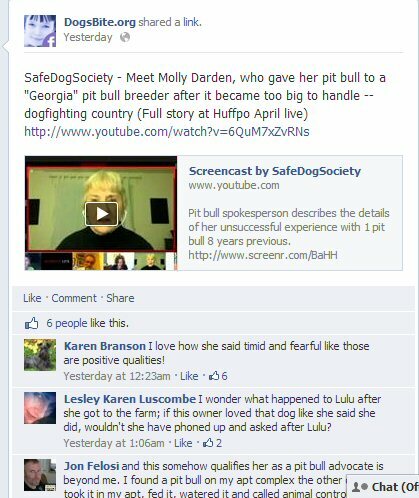 Colleen Lynn Holder, We invite you to find information on Pit Bulls that is not from the links you have on your page. Every link you have on your Page is either from your cult members and or Biased people whom has had a similar experience as you, that has nothing better to do, than seek out this vendetta. Calling on Safe Douche Society to make a YOUTUBE video cutting parts out of the segment proves what? The original Segment is still up and playing on HUFFPOSTLIVE.COM. Molly did what she felt was right, if a dog was fearful and strong like her’s many people back then didn't know what else to do, but to deliver the dog to the shelter. Yes large dogs are strong; yes large dogs can pull on the leash hard to where the owner falls down and loses control of the leash, it is not just PIT TYPE DOGS either that can do this... Molly should not be blamed, for trying to help this pit bull that was abandoned. You and your followers don't know Molly’s situation fully, you cannot blame her, and you cannot say these things about a person. You claim you are a social activist; social activists don't attack, or belittle people they speak on behalf of people. Georgia is not the only dogfighting state either, Philadelphia, Texas, New Jersey, New York, California, Florida, just to name a few. Anonymous is more of a Social Activist than you, they are for peoples rights and freedom. Colleen as we have stated before, you are nothing more than a Genocidist propagating to kill all pits, you only target pits. We love how you changed your website overnight before the interview and then switched it back to the way it was afterward, brilliant, but psychotic. Your organization does not, advocate for the sterilization of pits, it advocates for the killing of pits, many people are blind to this, many people have followed you, many people are also waking up to your hatred. And to my fellow advocates and to those just coming to this conclusion- I will share with you now the ORIGINAL segment that took place in April. Even with experts explaining the differences, along with stating how it is, Colleen Still does not get it. They banned pit bulls on military bases, from police enforcement, and therapy. Really Have they now? Elle The Therapy PIT BULL that you so casually slandered a couple of weeks back. 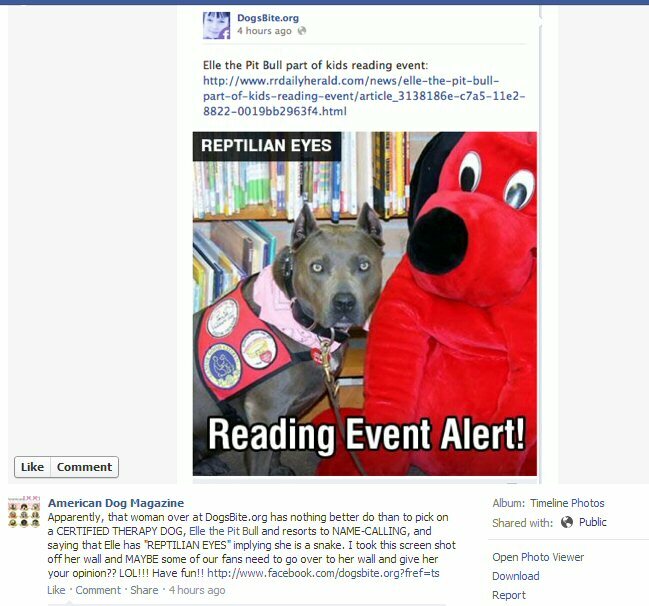 After this was posted on Colleen Lynn's Wall American Dog Magazine took liberty of taking a screenshot showing how callous this woman truly is. Many Advocates went over to Dogsbite.org and made statements, we were a few of them as well. And what did Colleen Lynn do? Banned us from ever commenting again. We don't see reptilian eyes, We see loyalty, courage, beauty, intelligence. We see a family dog, a companion, a soul and most of all, we see a dog who has been trained to help kids/adults overcome difficulties. 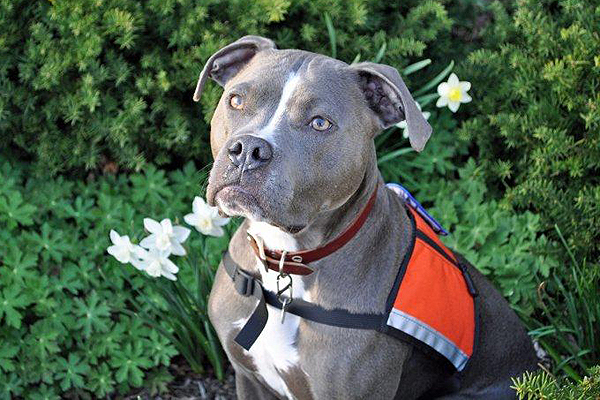 Here's some links to other dogs that are Service DOGS, "Pit bull" service dogs or should I say Emerging Hero Dogs. His name is Coal, he is a Search and Rescue PIT BULL TYPE DOG. Drug Sniffing PIT BULL named POPSICLE! Did the military ban pit bull type dogs? Yes, from the BASE HOUSING AREA'S, not from the military units or platoons. THE BASE HOUSING "Family living areas" are not allowed to have these dogs. Yet the MILITARY still uses Pit Type Dogs. No one said the military was intelligent, in fact this is quite an oxymoron. Banning from the housing area's yet still use them for bomb sniffing and other tasks? So you see Colleen Lynn, there are more Animal Activists, or as you consider "Nutters" that are willing to travel great miles to help these loyal dogs to get home, to find a home, to rehabilitate them, to make sure they are safe. Your arguments are invalid, your tantrums are unwarranted. We are watching, we are the voices for the voiceless, we are advocates, we are activists. WE ARE THE MAJORITY, we are many and we will continue to fight against you, the bsl and your cult. FOR WE WILL FIGHT UNTIL BSL IS ABOLISHED. Hope the Huffington Post saw this article, guys. Colleen Lynn and her hate-filled cultists are finally getting the exposure they deserve. They probably didn't see it, wouldn't know how to go about contacting them either, Since the one who hosted this segment Alyona Minkovski, doesn't supply her contact information. Otherwise I would personally send her an email or call with this link to here. Colleen is doing more than this. We will be posting about that in a little bit. How can anyone follow someone who takes such an adolescent approach on her so called plight?Whatever this girl is, it is obvious that she lacks any intelligence.I can picture this sub human scribbling over the face of a dog while giggling.She is pathetic.